Damp, draughty, cramped and often noisy - have you ever lived in a Victorian house or converted flat? But with features such as bay or sash windows, high ceilings, stained glass front doors and pretty brickwork they are often beautiful to look at and full of character inside. Walking down the streets of our towns and cities today it’s hard to not find a Victorian building. They’re everywhere! A population boom during this time led to a house-building boom and today they are some of the most desirable properties on the market. A typical Victorian house and entrance way. Queen Victoria oversaw one of the most rapid periods of change mankind has ever experienced. During her 64 year reign she saw the introduction of electric lighting, central heating, mass production and labour-saving devices for the home. She was on the throne from 1837-1901, and yet how different the homes of 1901 would have been from those of the generation which grew up in 1837. Watching the last episode of the recent period drama ‘Victoria’ made me wonder what life was really like back then, away from the romanticised filter of a camera lens. How did they decorate their homes? And can we learn something from them now? The Victorian era did not have a simple defined style. Rather it combined many influences into an eclectic mix and moved through different styles as trends came and went. Gothic Revival (1830-1900): This was one of the most influential styles in the 19th Century. Renewed interest in Medieval chivalry and an emphasis on romantic and courtly ideals had the knock on effect of a revival of designs and patterns found in the Middle Ages, as well as Gothic design. The Gothic revival in Victorian times was not the dark, forboding stereotype we envisage. Rather, it was an architectural style typified by intricately decorated churches, stained glass windows featuring complex trefoil designs, stencilled nature designs, heraldic symbols and tall arches. This dining room at Hughenden Manor shows off these Gothic features well. For a modern nod to Gothic, resist the urge to go too dark or too black. Instead, opt for natural materials, such as stone, darker woods and curved arches. The patterned chairs and cushions here show Medieval design elements and the rich colours complete the look. Oriental (1850-1900): Travel was a major reason this style became so popular. World trade opened up to exotic countries such as Japan and China and this had an increasing impact on British design. India was a key colony of the British Empire and especially significant in Victorian times as much was made there for the British market. This Victorian room showcases rich, sumptuous fabrics, ceramics and Eastern inspired objects. Get the oriental look in your own home by choosing a bold chinoiserie wallpaper. 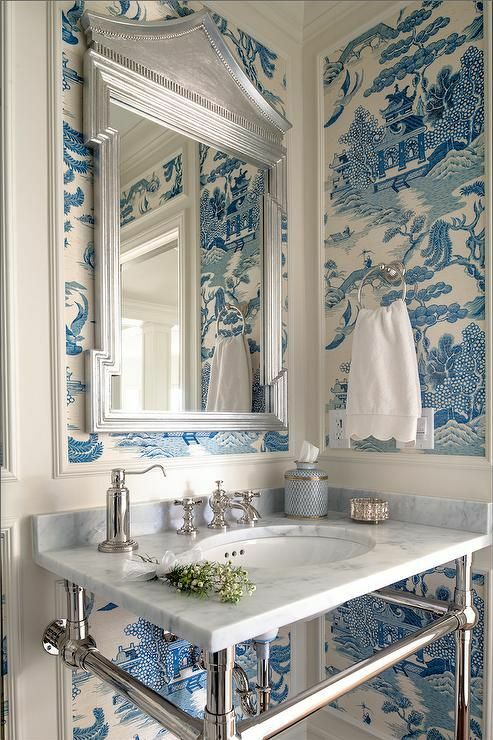 The timeless blue and white colour scheme here looks elegant with the marble sink and silvered shiny accessories. Classical & Renaissance Revival (1850-1915): Archeological discoveries from Egypt, Greece & Italy fuelled the imagination of designers. The Elgin Marbles had been brought to the UK from the Parthenon in Athens in 1812 and Greek and Roman sculptures of Classical figures were much admired. Mythology and figures from Classical history provided the inspiration for artists and designers. This Greek-style music room was commissioned in 1884 by American art collector Henry Gurdon Marquand for his New York house. The ceiling was decorated with paintings of the Greek muses and Greek and Roman vases and statues were displayed around the room.The suite of furniture was richly embellished with Greek motifs and was much admired in London before being shipped to America. The room also held one of the largest pianos in New York City. The classical statues above are the main focal point of this Victorian room. This room beautifully merges classical and modern style. The white statue is prominent, but does not dominate and your eye is first drawn to the painting at the end of the room, as well as the chandelier at the top. This allows the looker to appreciate the size and height of the room. The coffee table, as well as the wood of the furniture is dark, which would be in keeping with Victorian tastes. The light walls provide a perfect backdrop to help the furniture and accessories stand out in their creams and muted shades. The overall effect is well balanced and comfortable. The upper classes flaunted their wealth in their homes. Rich fabrics, ornate decorations, imagery of European fairy tales, lace, glass, china, multi-layered window dressings, busts, statues, framed paintings or prints, flowers and all manner of accessories were liberally added to every room. This was to show off all the luxuries that the family could afford and create a sense of opulence. However, the industrial revolution brought about a shift from traditional handmade products to mechanised processes producing items on a large scale. Mass production of furniture and household items meant that the middle classes could afford to furnish their homes in the latest styles. They poured over catalogues and emulated the wealthy either by buying a cheaper version, or by painting something to create a similar effect. This is why paint effects and trompe l’oiel (‘fool-the-eye’) wall papers were so popular. There was no such thing as restraint, the more the better. The effect could be one of acute clutter, or a complex, warm and romantic room. For modern tastes, there is not much desire for clutter, but a sense of opulence is still created using similar ideas to those in Victorian times. 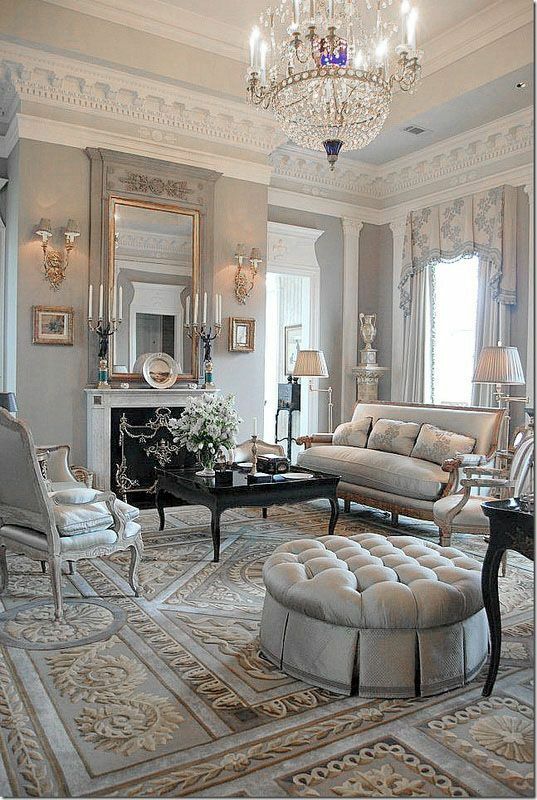 Deep buttoned upholstery, gilding, a thick rug and glass chandelier give a sense of luxury. The multi-layered widow treatment, mounted urn and emphasis on the room's ceiling height brings grandeur. The lighting is soft and the reflective surface of the coffee table, as well as the brass wall lights, candlesticks and mirror will ensure this room sparkles as evening sets in. The limited colour palette is lifted through this clever use of accessories and texture. Unlike today, there was no universal colour card for people to choose from, rather, paints were mixed locally and using the colour pigments available. Moreover, your choice of colour would also depend upon if you lived in the countryside or within a very urban environment. Those living in the cities preferred colours such as grey, deep green and grey blue to reduce the appearance of grime and soot from coal dust and stains from gas and oil lamps. In general, however, the Victorians had a very sophisticated colour palette and one which is often used today. In the first half of the era light walls were favoured, with the exception of dining rooms and libraries, which were richer in colour. The second half saw the emergence of vibrant, earthy colours and those that brought warmth to a room, such as walnut and mahogany brown, plum, aubergine, olive and sage greens, red and rust colours, burgundy, mustard yellows and dusty pink. The smoking room at Lanhydrock in Cornwall is a striking room - not least because of the tiger skin rug and taxidermy fox. However, it also uses two quite contrasting colours together - the sage green at the top of the room, with a more vibrant red pink underneath. David Ramsey Hay, a decorative artist and writer had two theories about decorating, one of which was 'harmony by contrast' - using together two colours on the opposite side of the colour wheel. This is a good example! This 'Ashes of Roses' Victorian heritage paint from Little Greene brings warmth and looks fabulous behind this citron sofa. A brilliant colour scheme to bring some Victorian flair to your home. Complex patterns filled most areas of the Victorian home. Multiple wallpapers covered walls and ceilings, plush fabrics trimmed with silk tassels and embroideries as well as intricately woven Oriental and Persian rugs. Victorians loved pattern and used it liberally throughout their homes. Wallpaper in particular was in high demand. It had gone into mass production in the 1840s and soon became more affordable. Popular styles had backgrounds of red, blue and green with prints of large floral, bird and animal motifs as well as damasks. William Morris was a well known designer during this time and his designs dominated most wall papers and fabrics in the home. He was renowned for mixing strong, pure colours harmoniously, and giving a flat pattern a narrative quality. This room at Standen is decorated using William Morris designs. Despite the many different patterns, the calm colours of greens, blues and creams, as well as the naturalistic motifs make it a comfortable space. Patterns dominate this room - on the floor, the walls, ceiling and sofa! This room pays homage to Victorian styling. The patterned wallpaper and luxurious pink velvet sofa work really well. The patterned cushions unite the wallpaper and furnishings. The simple wall pictures and plain armchair and coffee table help to make this room feel comfortable and stop it from being over cluttered. What do you think about Victorian decorating? Will you be adding some of these design features to your home? The bricks and mortar on the outside of a Victorian home may be old, but the decorating ideas of the time can be updated to create a modern interior that still pays homage to its rich past. I’d love to see how you've incorporated this style into your own house.